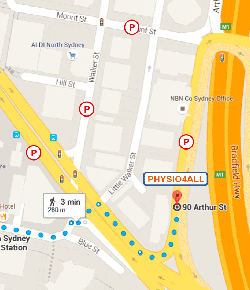 New Parking options: ½ hour meter street parking outside the clinic on Arthur St between 10am – 3pm. Metered Street parking on Mount St & Walker St – watch out for clearways. Alternatively the Car park in the Greenwood Plaza is a 5 min walk away – first hour free if you purchase something in the Greenwood Plaza.